I had lots of time this week to knit which is always a good thing. I got a good head start on a project, plenty of time to read and caught up on tv series I had recorded. I feel like it was the calm before a storm. I remembered to contact Redfish, Baah, Briar Rose and Miss Babs to see if they would like to donate some yarn to give as door prizes at the Masters Day in Reno. The good news is all said yes. I got lots of new course orders this week, many due to Sue from IN who finished up the course a few weeks ago. It makes me very happy that she feels the class was so beneficial that she recommended it to friends. Several factors impact blocking. First of all, you have to use a fiber which can be blocked. It is next to impossible to adequately block some fibers. For example, it is next to impossible to block acrylics. 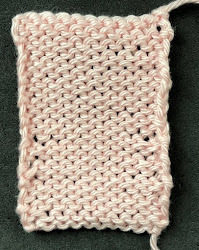 Try knitting a small stockinette swatch. Photograph it. Block it properly. Compare the before photo to the swatch. There will be almost no difference. The sides and the top and bottom will be curled. Yes, you can try steam blocking acrylics but be careful, the fabric might melt. Part of becoming a Master Knitter is understanding what fiber to select for projects. If the fiber cannot be blocked, it should not be used for swatches. The stitch pattern is also a consideration. 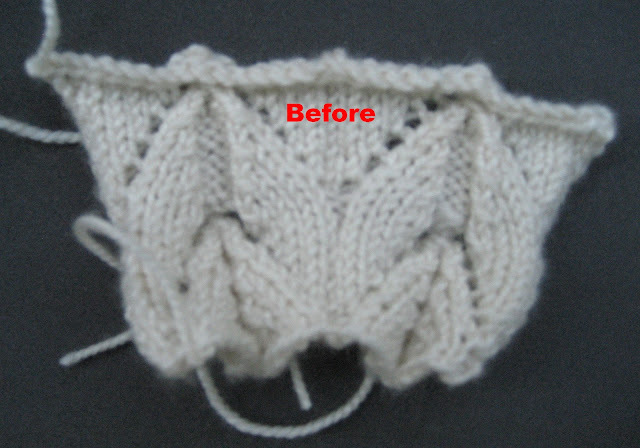 Stitch patterns, like stockinette, which produce curled edges should be blocked. Some knitters don't block stockinette if the edges will be seamed. Keep in mind it is easier to finish edges which have been blocked. 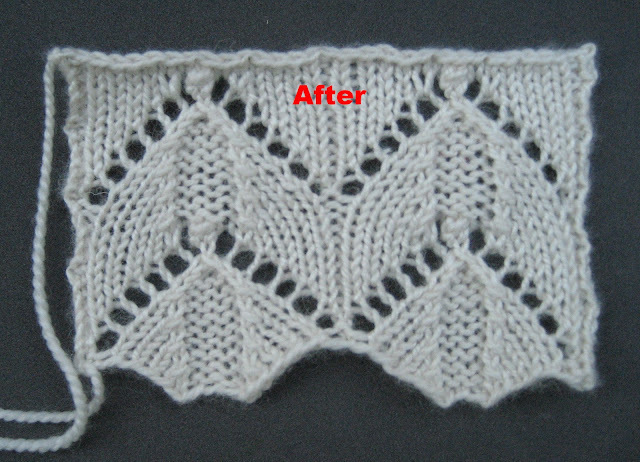 Some stitch patterns, like lace, MUST be blocked. If you don't, it won't look like lace. Trick Question: Should acrylics ever be used for lace? See above. Textured stitch patterns, like cable and ribbing, must be blocked very carefully. Always consider how you want them to look in the final product. For example, I would block the pieces for a Aran sweater very differently than I blocked the Medusa Coat (see below) where I wanted the cables to appear like embossed motifs. Don't stretch ribbing or cables unless you want to completely flatten them. The blocking method depends upon the fiber and the final results. For most projects, wet blocking works. Why? Think about how you are going to launder the final fabric. The one thing that I am not going to discuss in this blog is the mechanics of blocking. Leslie Gonzalez, one of the co-chairs of the Master Hand Knitting Committee has an EXCELLENT video on how to block. Here is the link: Leslie's Blocking Video. If you ask most knitters to name three things they don't like to do their answers will include knitting gauge swatches, blocking and finishing. (I think many knitters dislike doing these things since they aren't sure how to do them properly.) Unfortunately it is these three things that make knitted garments fit and look hand made rather than home made. What most knitters like to do is knit. Their excuse is that these things take too long. Yes, they do add time to the project but if you put it in perspective how long you hope to have the garment, it may not see that long after all. A gauge swatch is what you should do BEFORE knitting the project and blocking and proper finishing are what you do after knitting the project. I've had knitters complain to me that, yes, they did knit a gauge swatch but the garment still didn't fit. When I ask them if they blocked the gauge swatch, they look at me as if I have asked a completely ridiculous question. How on earth are you supposed to know what the final fabric will look like unless you block your gauge swatch? How can you get an accurate measurement? Blocking the gauge swatch is essential. There is blocking for the Masters Program and then there is blocking in real life. What do I recommend? You will always find knitters who say they rarely block. Good for them. In some projects you can get by without blocking. 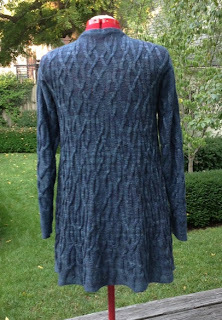 If you are knitting a stockinette baby sweater using acrylic yarn, why bother? It wouldn't make a bit of difference. I recently read The Ravell'd Sleeve:The Journal of the Couture Knitting Workshop by Catherine Lowe (thanks for the recommend Suzanne) and I discovered that I have the same approach to knitting. 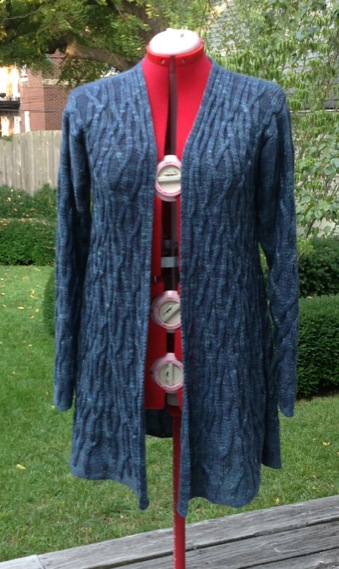 I like my garments to have a polished look and proper blocking contributes to that look. I always wet block. A friend of mine who is a dyer told me that to properly wet the fabric, it needs to completely absorb the water so I fill a basin with water and I place the fabric on top of the water. Sometimes it takes minutes, sometimes it takes all night. I always block my gauge swatches (even garter stitch). I block the pieces before finishing and I sometimes block again after finishing. How you block or whether you block at all is up to you and how you want your final project to look is up to you. One word of advice....be VERY careful if you use a steam iron. During my time on the Masters Committee I reviewed thousands of swatches and the worst ones I ever saw were over blocked by steaming. The stitch patterns were flattened and the fabric was sometimes scorched. It was enough to make me put my steam iron away forever. Salon will be on Saturday this weekend. Generally in the fall I try to have Salon on Sunday so as not to interfere with the football schedule. Sad to say, even my friends who were fanatical about going in the past are not going this year. Doesn't bode well for the Cats. I did finish up my Medusa coat and I am pleased. Too bad it isn't cold enough to wear it yet. I should be able to wear it in Reno. By the way, I blocked this fabric very firmly. As I said above, I wanted the snakes to appear embossed on a background of reverse stockinette. I finished up the second Leaves of Spring sock but I didn't bother to photograph it. I got started on the side-to-side garter stitch skirt. It is such a pleasant change from Medusa's Coat where I really had to pay attention. I can read while working on it. 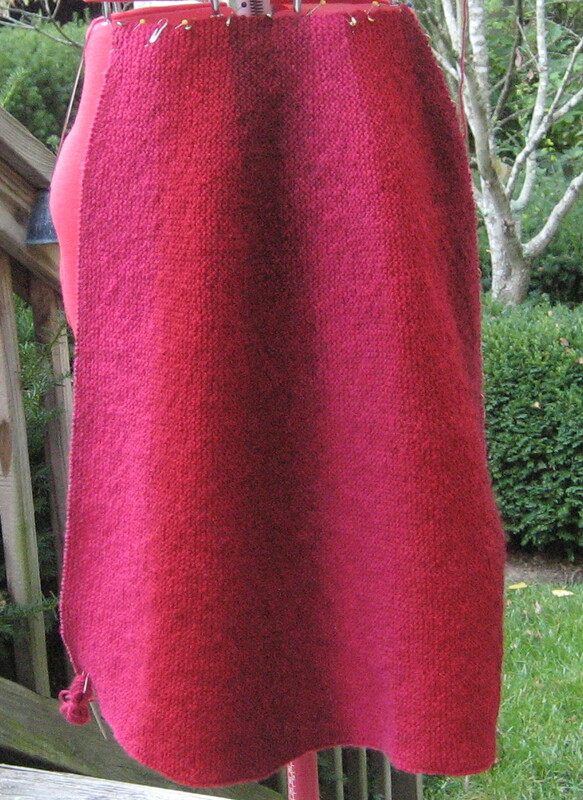 I used a provisional cast on and the skirt is shaped by short rows. I selected Kauni Effekts as the color changes work well with the short rows. I pinned it to the dress form. Even thought it is garter stitch, am I going to block it? Of course.